Research that impacts local and global resources. 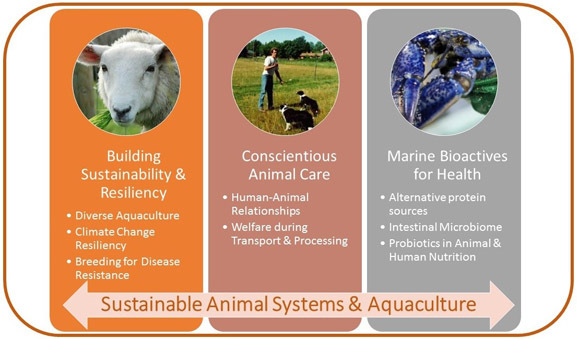 Animal biology and behaviour, production of animal products like meat and dairy and how animals are used in fields like genetics and environmental sustainability. Both research and teaching take place using the state-of-the-art facilities and hands-on learning opportunities found in the campus farm complex. The Aquaculture Centre provides students and researchers with over 8100 ft2 of well-equipped teaching laboratories and aquatic rearing facilities. Reliable freshwater and seawater sources, along with modern mechanical systems, allow for precise environmental control, enabling work with a wide variety of species - from cold water marine fish and shellfish to tropical freshwater fish. The Aquaculture Centre houses a teaching lab, a dry lab, two wet labs and an algal production lab. Learn more about our research centres and labs.